I have posted previously about low attendance at training sessions. I do so again today, not because the topic is fascinating, but because that is what we have at the moment. Last week, 3 May, we had four skaters on track, though Chris is still recovering from his back injury, so he was light contact and frequently stepping out. Yesterday was a similar tale, Baker, Bucking, Bilb and myself, with Bilb returning from injury. Once again Carly was a superstar, stepping in to deliver the session. The session was really good, exhausting for all, as they should be. In amongst the endurance drills we worked on blocker pairs and three walls. Despite his injury Bilb worked hard and was on track for most of the session. There were some awesome hits too. Buckingham hurt his shoulder with a mistimed hit on Baker. Baker got very impressive hit to my chest that sounded much worse that it felt – it made every stop and check that I was okay. It was also my first outing on my new plates. These are Roll Line Blasters mounted on my crappy old (2 years) Suregrip GT50s. I wasn’t sure what difference they would make, but they feel utterly different. I’ve not adjusted the trucks on them, and I guess they are as stiff as they’ll ever be. They felt much more directional, which gave me more confidence when doing cross-overs. I also noted the lack of creaking and the accompanying flex when on my toe stops. I was also released from the nagging fear that landing hard might result in a plate breaking. Jamming was much more enjoyable! The new plates are heavier (523g vs 429g per skate), but the difference is not discernable. I didn’t expect that it would be. In researching which plates I should get I weighed my wheels (457g per skate). The weight added by a decent plate is small in comparison. In summary then, I’d recommend upgrading your plates if you can afford. The process of replacing them was easy – see my notes on the process. The role call this week was Matt, Buckingham, Si, Baker, Jim, me and Carly our ref. Captain Chris is still off with his back injury (muscular) and will be for another month I reckon. Coach Gillie and Phil couldn’t make it at short(ish) notice. A massive thank you to Carly for coming up with a good session at short notice to keep us on our toes for two and a half hours. It was all about agility this week. We did lots of solo work practising transitions and stops around obstacles, jumps and duking. Another “drill” that Carly introduced was random calls to jam. She’d call “five seconds!” and we all had that time to form a four wall on the line against a jammer/pivot combo. We’d have a two minute jam. Pivot and jammer would then switch and we’d go again. With so few there we couldn’t stick to the training programme and a scrim was obviously out of the question. Fortunately Matt wanted to work on his minimums so that’s what we did. It was the first time out for me in my new knee pads. Knee falls were enormous fun as the pads are way more slippery than my old ones. I could slide for ages! We also had lots of time to practice our own skills and time for some messing around too. I’ve been working on jumping two foot translations. I’ve found that going to the skate park at The Works has made me more confident about jumping. I’ve always liked to keep my skates on the floor. Matt did really well. He ticked off his 27 in 5 with style, hits he’s always been comfortable with and falls are easy. Well done Matt! At the end of the session I did 24 in 5 clockwise, which I was pleased with, 27 very soon I hope. On Monday evening I made it over to The Works again. This was an extra “skaters only” that Ashleigh had organised for Gemma (I believe, as she is moving away from Leeds soon). This too was low numbers, though it was expected. Discussion in the Fraternity of Rogue Skaters group had concluded that a monthly meet would be best. I highly recommend it, next one is 27 October if you can make it. My achievement was to jump flat top of a block with ramps. I’d like to be able to grind, but that’s going to take some work I think. Sunday is Skateful Dead training day. I woke in Hull after a good night’s sleep at Hull Trinity Hostel. I figured that I’d get an early train back – I’d booked a ticket on the 10.40 arriving in Leeds at 12 noon. However I found that train tickets purchased on the day are three times the price of those bought in advance. Crazy! So I called in at McDs for breakfast and then went and settled in the Starbucks across the road and read my book. Scrim was hard work; we were low on numbers. Four a side to start with, then three a side. Si-clops loves to jam and he’s pretty good at it, though Matt did knock him off track once – good job Matt! Yesterday evening I trekked over to The Works in Leeds. Spinal Taff had arranged with them to have a “wheels on your feet” only session. So, no scooters, BMX or boards. The Works has a climbing wall (also of interest to me) but also an big indoor skate park. Loads of derby players were there, I reckon more than 20, some with their kids. I was pleased to recognise many from Leeds Roller Dolls and Aire Force 1. Most of those skating were sporting their quad derby skates. I was in my Rollerblade Broskow in-lines, right in this photo. These are made for ramps, half-pipes grinding and such silliness. I’ve had them for years, but never used them much – landed badly numerous times. Derby though has improved my skills and given me more confidence. I didn’t drop in on any of the big quarters and I didn’t grind anything – aims for the future – but I had tons of fun. The skate park has a lovely long section called “Easy Street” that is mainly flat ramps. By the end of the evening I had a lovely run from end to end. It included a ramp with a jump up a step on to a platform and a drop of around 40cm. I only fell over twice, but the wooden surface is much nicer to land on than concrete! After two hours of craziness I was very sweaty and very happy. There are plans to run the session monthly. Cost for two hours is £4. I’ll be encouraging my Skateful Dead bros to make it over there. I can see that this is going to be really helpful at building skate skills. The bank holidays doubled the length of this weekend and I made good use of it. I have set myself a goal. I want to return to playing roller derby and when I do so I want to ‘good‘ at it. ‘Good‘ isn’t a precise measure and isn’t benchmarked. There will always be players better than I am, and less experienced players who have yet to catch up to me. ‘Good‘ is my own perception of how I’m doing, whether or not I’m pushing myself and whether or not I’m improving. Over the past four days I have skated every day. On Friday I skated quads in the park and found that by changing the lacing my feet feel more secure in my skates. I’m still far from comfortable on toe-stops but this has helped. Saturday I did my usual gym/swim combo in the morning and then hit the park in the afternoon. In-lines this time, chilling and messing around with cone slalom. We also did an endurance section, speed laps for 60 seconds interspersed with various exercises (press-ups, plank, etc). Really hard work, but with much quiet cursing, achievable. Monday was sunny and so I was back on skates in the park. I’ve skated in People’s Park for many years, most of that time alone. This time though Carly organised a bit of a picnic and there were loads of us, mainly Dead but a few from Leeds too. I was challenged to slalom the 50cm spaced cones and, amazingly, managed to do so without knocking any down. I skated in-lines again, taking some stick from the others who were all on quads. It was lovely to have company. In amongst all the skating I managed to find time to go out with friends and drink beer/eat pizza, sit and eat with my kids, my dad (who was up from Nottingham) and my mum, sister and niece/nephew who are over from Berlin. I leave you with links to two videos. The first is Demetrious George, an aggressive skater, jumping up to a 5’10” high edge. His flexibility and one-leg squats are a (distant) goal. The second is Naomi Grigg, a well know skater from London, showing how to do the Grapevine on in-line skates. The third pivot continues to elude me. 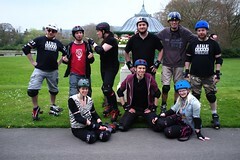 Posted in Freestyle, Inline, Quads, Roller DerbyTagged "People's Park"
All this week it’s been sunny in the afternoon. From my rather nice window seat at the new offices in Leeds I have wished that I was out skating. So on Saturday I did just that. Today was practice. We had a new bod start and also a guest from Deathrow Hull! I stepped out of some drills – looking after myself! So, another two hours on wheels, bringing the total this weekend to a little over six hours. Tuesday night is free skate night at Whitcliffe. Well, it was. Yesterday was another quiet session, I think there were perhaps ten of us there. The cost of the hall when shared by so few makes it quite expensive. It seems that from now the recommended mid-week opportunity to roll will be Midweek Masterclass. This is the session organised by Leeds Roller Dolls. To be fair, this might not be a bad thing. The larger the pool of skaters that you practice with, the larger the pool of training and techniques you experience. Our trainer, Gillie, skates with the Banditas. She will pass on what she’s learnt. The Skateful Dead also welcome Banditas to our training sessions. In practising with them we will learn their skills. If we practice with LRD skaters then we are potentially exposing ourselves to variations in technique. It’s all good! Anyway. I’m still non-contact in practice. I had a list of things that I wanted to work on. I continue to work on my weak side for transitions, t-stops and cross-overs. I believe it’s important to be able to perform these fluidly. There will be situations on track where, for instance, you need to transition to your weaker side. My aim is to improve so that I don’t have a weaker side. It will take time. I also spent some time helping Kelly with her transitions. Well, I hope she found it useful! When I did the ICP qualification one of the techniques that we used when teaching new skills was to break the skill down into it’s component parts. Geeky yes, but I find it useful. I also continued to work on my plough stop. Over the past few months I have asked various people how to do them. I have never had a satisfactory answer. Well, I’ve never had an answer that I have considered was detailed enough. “Make and A frame and point your toes in” is apparent enough. I can do that and roll for ages! “Push through your hips”, “Pretend you’re having a poo”. I’ve not found those helpful. Sorry! Then whilst I was kicking around at practice on Sunday I found what I hope might be the answer. I was rolling backwards, just slowly, then doing a gentle backwards plough stop. The stop was achieved with my inside toe wheels; that’s where my weight was! It follows then that I need to get my weight through my inside heel wheels when rolling forwards. I worked on this last night and it seemed to be an improvement. I also found that an asymmetric stop worked better – leading with my right foot – as always. Yesterday the weather was good enough to get some time skating in the park – People’s Park. In the end I managed just about 4 hours, which made me very happy. In amongst messing around with cone slaloms I kind of practised transitions and plough stops. I also stopped and chatted with loads of people. First there was Rafiq. He has a disabled son who is showing an interest skating. So I helped him for a bit. I also chatted to a Polish couple – their son enjoyed cycling though my cones. A bloke, 37, who used to play Rugby but is now into downhill mountain biking. Finally a bloke from down south who, I think, felt I must be mad. He made his escape when I started talking about wheel hardness. So, on a technical level, I confirmed that I lead *everything* with my right foot. My clockwise transition from front to back feels smooth. When I broke it down I found that I go from my usual slight right foot lead to a scissor with left foot leading. Then I rotate, but immediately switch to a scissor with my right foot leading (going backwards). I spent some time forcing myself to roll backwards with my left foot leading. I got to a point where I could rotate, but it seems very clunky. Next I worked on my plough stop. I frankly got nowehere with it and I don’t know what I’m doing wrong. Everytime it took me about 10 metres to come to an almost stop. So that’s something to work on! So this weekend I trekked to People’s Park carrying two rucksacks – one for by inline skates and one for my quads. As new boy I felt I should really get some practice in. I also wanted to compare them. The first problem was that the whole of the elevated section where I usually skate was still snow covered. Fortunately the path around the fountain was clear and dry, so I made do with that. I started off in the quads. This was the second time I’d worn them and they still feel heavy and clunky. Cornering feels ridiculous and they wheels are very noisy on tarmac. I practised t-stops, on my my good side and my bad side! Cross-overs a little, though I didn’t fancy landing in the fountain if I got it wrong. 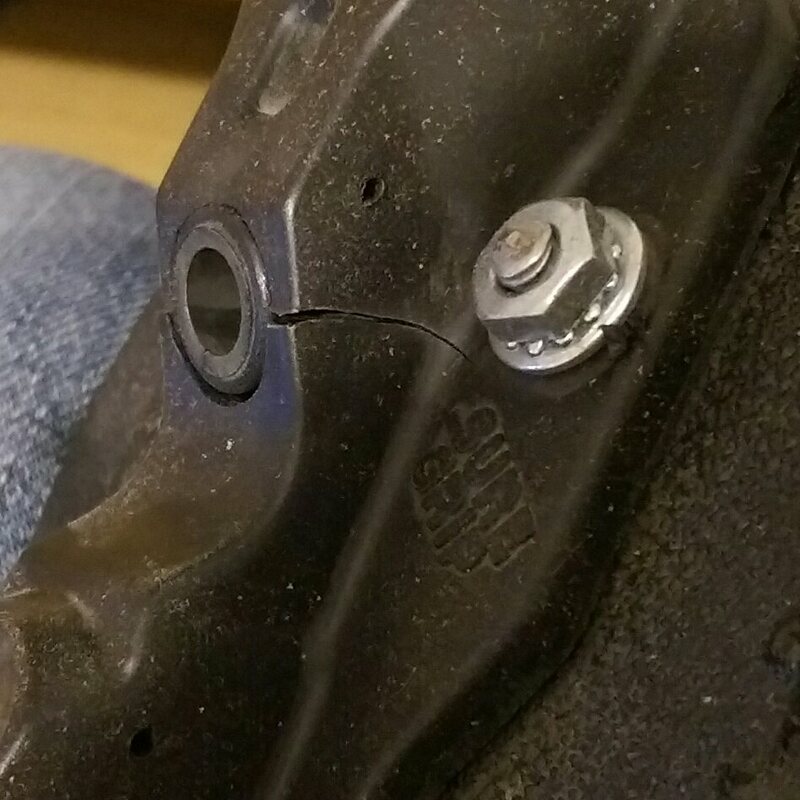 I also tried stopping with the toe stop. I think I’ve sussed the secret of not falling over, but time will tell. Then I switched to my inline skates. My heels felt very low! I have found this when switching between my Salomons and my Hypnos; my heel feels lower in the latter. However, the mild panic that I’d never cope with switching between the two soon passed and I was gliding about just like normal. So, are the quads heavier than my inlines? Well yes, but only by a little bit. I weighed them, as you do, when you’re a bit OCD. The quads weigh 1.564kg each, inline skates 1.533kg each. I also weighed my aggressive inline skates. They come in at 2.137kg each! Perhaps they should be my training boot? And the noisy wheels? This is all to do with wheel hardness. Further reading revealed that my quads have 95A wheels – normal for indoor use. 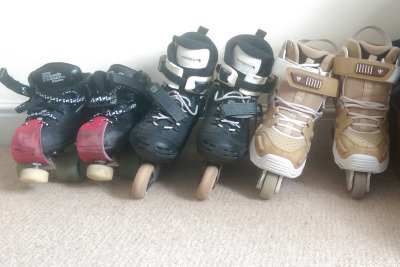 My inline skates have 84A wheels, designed for concrete.